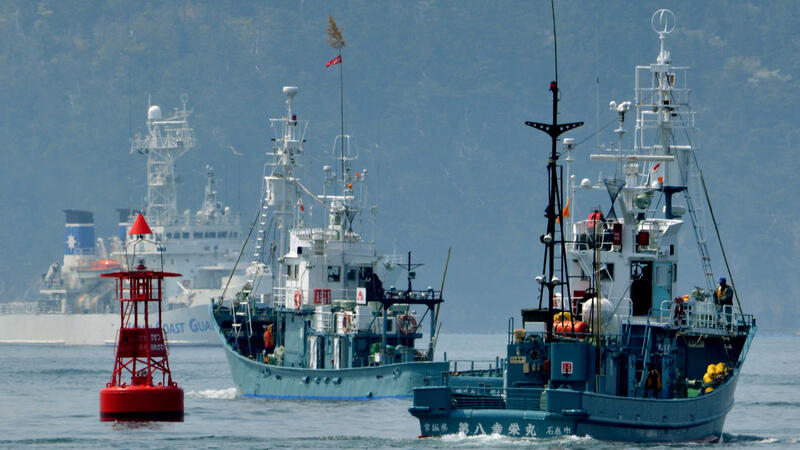 A Japanese whaling fleets leaves the city of Ishinomaki in April 2014 as a Japan Coast Guard vessel provides security. Japan will withdraw from an international organization established to limit whale hunts in an apparent attempt to resume commercial whaling, according to Japanese media outlets. Public broadcaster NHK reports that government officials informed ruling party lawmakers on Thursday. The Asahi Shimbun, citing unnamed sources, said a formal announcement was likely "within days." "Under the rules of the International Whaling Commission, of which Japan is a member, there has been an international ban on commercial whaling since 1986 — though there is an exception for whaling conducted with ecological research in mind. It is this exception that allows Japan's whaling fleet to embark on its yearly hunt in the icy waters of Antarctica. "Yet many critics view this use of the exception as a fig leaf, exploited by Japan's Fisheries Agency to cover for the practice of reportedly selling whale meat commercially." In 2014, the International Court of Justice ruled that Japan wasn't conducting enough research to justify the hunts, and ordered Japan to revoke Antarctic whaling permits. After a year's pause, Japan began what it said was a scaled-back whaling program. The popularity of whale meat in Japan has declined over time — along with its profitability. However, as Lucy Craft reported for NPR in 2010, "Japan's whaling rhetoric is rooted in national pride and the need to fend off what is seen here as the high-handedness of Western nations." Japan's decision this week was driven by frustrations with what officials see as an anti-whaling agenda at the IWC, according to The Associated Press. Earlier this year, Japan tried to persuade the commission to drop its ban on commercial whaling. That effort failed in September when it lost a vote among the organization's 89 member countries. A spokesperson for the IWC, Kate Wells, told NPR via email that the group hasn't yet received formal word of the decision. "Like other inter-governmental organisations, there is a withdrawal process and all member governments have the right to withdraw," Wells wrote, adding that Japan will have to give notice by Jan. 1 if it wants to leave in 2019. Some conservation groups denounced Japan's reported decision. "If Japan leaves the International Whaling Commission and continues killing whales ... it will be operating completely outside the bounds of international law," Nicola Beynon, of the Humane Society International in Australia, said in a statement. "This is the path of a pirate whaling nation, with a troubling disregard for international rule."